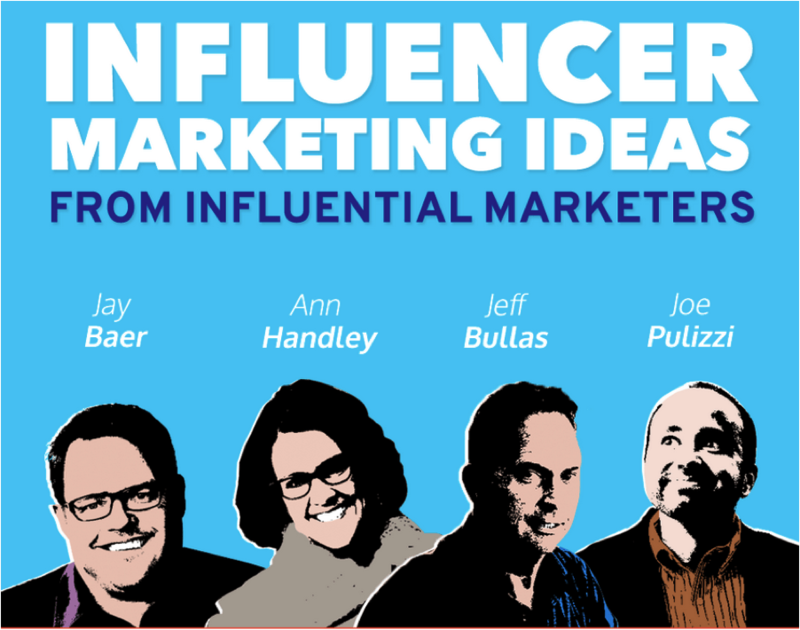 I was at the Social Media Marketing World conference in March when I discovered this post, “The Top 100 #ContentMarketing Thought Leaders.” The list comes from Onalytica, a company that makes influencer relationship management software. And you may ask yourself, well, how did I get here? I began blogging and getting active on social media just three years ago. Did I purposely aim to become an influencer? Maybe. Mm, probably. Okay, yes, I did—but not to earn the moniker ”thought leader” (which I really dislike). So why? Well, I’m a writer. What I wanted was to reach readers and to, well, influence them. Influencer marketing isn’t a tough concept to grasp. Basically, it’s the process of developing relationships with influential people that can lead to their assisting you in creating visibility for your product or service (a nice definition I’m borrowing from the Moz blog). Michael Jordan may influence your underwear selections. Rachel Ray might inspire the dinner you prepare tonight. Barry Feldman may have some influence over what you read and share with your tribe today. Simple, right? Let’s talk about Rick Springfield now. Flashback… Content Marketing World 2012. 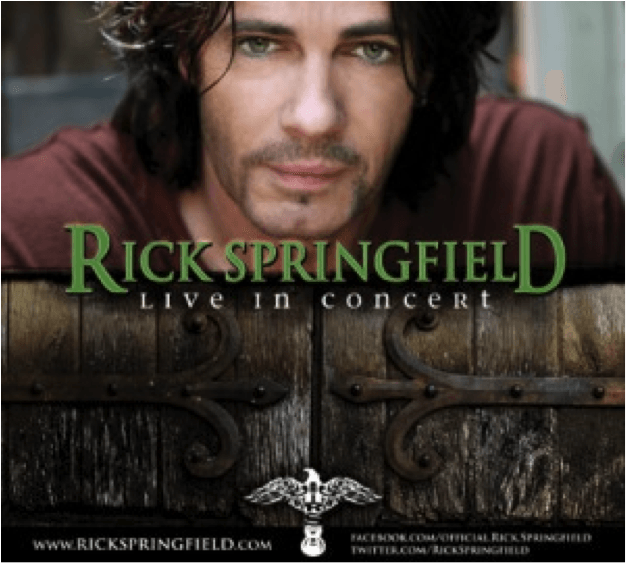 Rocker Rick Springfield will be performing for us at the LC Pavilion in Columbus, Ohio. At the pre-show BBQ, I spot Jay Baer. Never met the man. So I introduced myself. I might have complimented one of those plaid sports jackets he digs. Nice guy. He seemed genuinely interested in me. I asked Jay for a business card and he handed me a heavy metal one. 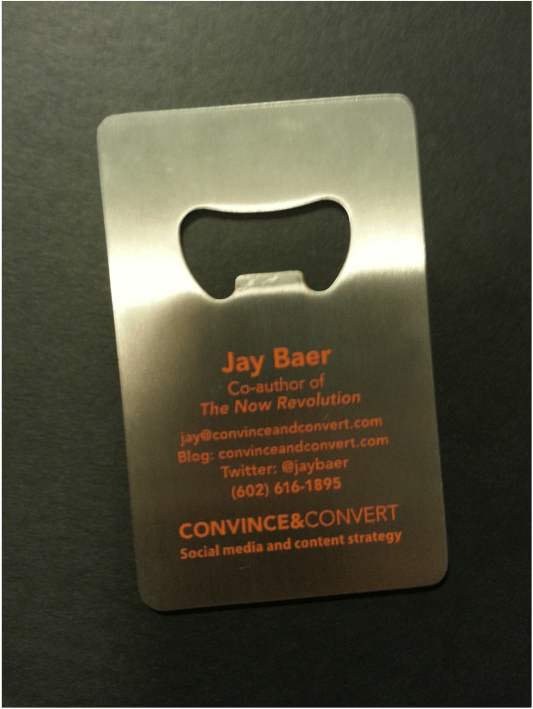 It was a bottle opener, a bottle opener business card that’s opened more than bottles for me. That thing has opened doors ever since I introduced myself to an influential marketer named Jay. Let’s get back to that list. When I got home from Social Media Marketing World, I took a long look at that content marketing leaders list I landed on. It occurred to me that I’ve come to know the majority of the people on it. At least 20 of them are friends of mine. New friends. New media friends, actually. Influencers. I decided I’d ask some of them to share a tip on influencer marketing. I got a great response and decided to create an infographic (with a major assist from Seth Price of Placester). When I look at what these men and women had to say, I think about how much sense their suggestions make. Many describe the very things I’ve tried to do these past three years. Sure, a lot of it traces to social media. Social media makes influencer marketing more accessible—and important. But it’s more than social media. It’s about connecting. It might happen via a social media exchange. Could be an email or a chat. It very well could be a handshake. I’ve been doing a whole lot of all of these. And I’m very glad to say I’ve connected with some world-class marketers—and people.